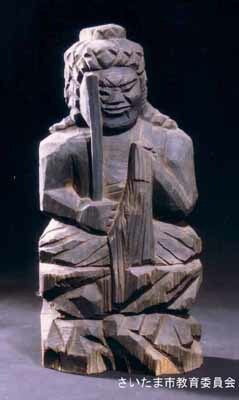 Fudo assumes a frightening form, with a sword in his right hand and a rope in his left. He sits in front of a swiring flame of fire, with which he purifies evil. The left section of the flame is a modern replacement. 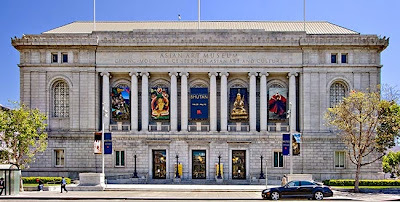 From my visit to the Asian Art Museum of San Francisco in 2013. Fudo Myo-o ("Immovable Wisdom King") is the most important of a group of five deities, each of whom represents the wrathful energies of a Buddha and has the power to convince the reluctant to accept the Buddha's teachings. Fudo Myo-o is an emanation of Dainichi (Vairochana), the Cosmic Buddha. 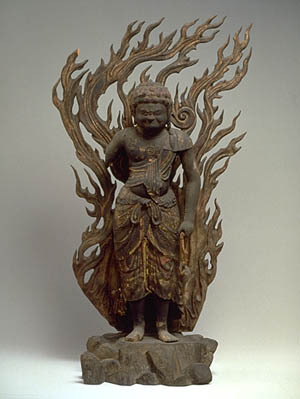 This image of Fudo Myo-o was once part of a group of five sculptures and would have been placed in the center of the other four myo-o ("wisdom kings"). 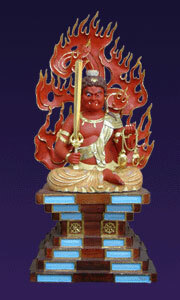 Fudo Myo-o's dark skin, fierce expression, fangs, and bulging eyes indicate his power to vanquish all demons. His sword cuts through delusion and the lasso he carries pulls even the most wayward beings toward the path of salvation. The statue was made of Japanese cypress (hinoki) using the joined woodblock method of construction. 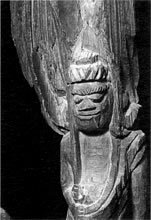 In this technique, different parts -- such as the head, hands, feet, and torso -- were carved from separate pieces of wood, the head and torso were hollowed out, and then the pieces were assembled. 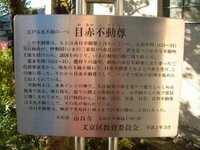 After joining, the sculpture was covered with a gessolike material and painted and decorated with cut gold and silver leaf (kirikane). 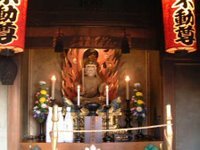 A hibitsu or “secret Buddha” is a temple statue, not necessarily of the Buddha, that is shown rarely or not at all. Cultures around the globe have religious art intended to be displayed on special occasions. Japan takes this universal idea to chronological extremes. Some hibitsu are shown only every 7 years, or 33 years, 0r 60 years. In a few cases they have been made with the intention of never being displayed at all. 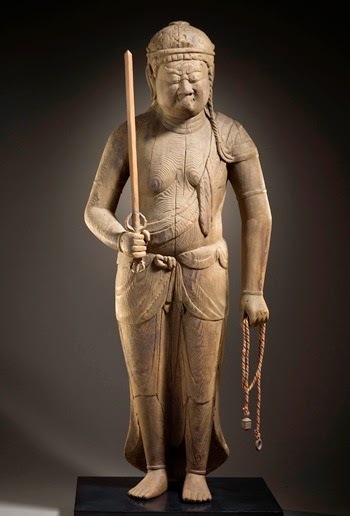 LACMA’s new Fudo Myoo: The Indomitable Foe of Evil (about 1125), a gift of Irene Christopher, Scott M. Delman, and the 2012 Collectors Committee may be one of these rarely-seen objects. is part of the exhibit "Masterpieces of the Mary Briggs Burke Collection,"
opening at New York's Metropolitan Museum of Art Tuesday. The exhibit showcases the biggest and most comprehensive private collection of Japanese art outside Japan. This is a rare picture because besides the two child attendants who usually accompany him, Fudō-myō-ō is trampling down two figures under his feet. In this work, details of the furious face of Myō-ō and the pattern of the garments are superbly expressed and the well-proportioned composition shows the grandeur of Buddhist art.
. Welcome to Master Carver Enku 円空 ! . Saint Mokujiki was born in Marubatake in 1718. He converted to Buddhism when he was 22 years old, and received his ordination with the name Mokujiki at the temple Rakanji in Tokiwa at the age of 45. Mokuji underwent a type of severe ascetic training that does not allow the consumption of grains, fish, boiled food and salt. He kept to the rules of this training for his entire life. 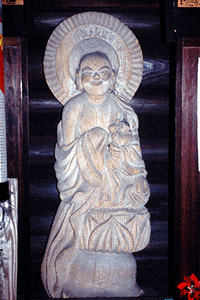 He went on a pilgrimage throughout Japan until he was 93, and carved more than 1000 Buddist images during this time. In his old age, when he had passed 80 years, he realized that people need something king and gentle to become kind themselves. everything needs to be all round and smooth!" He then started carving Buddha statues with the special smile on their faces, for which he is now so famous. The smile and roundness makes his statues so different from the ones of his fellow Enku. Click HERE to look at more of his statues !!!!!
. 狸谷山不動院 Tanukidaniyama Fudo Temple . In 1718, Saint Mokujiki practised zen ascetics in the cave here for 17 years.
. Saint Tanshoo 但唱 Tansho . Who made Buddha Statues ? 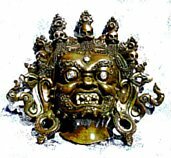 "Some also say Fudo is the Hindu God Shiva. 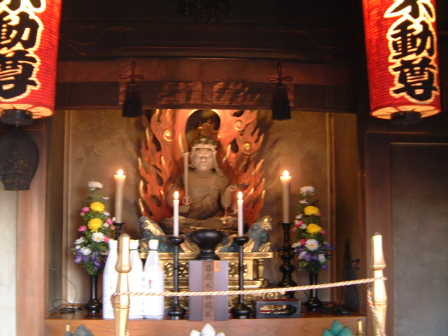 Flames in background said to represent the purification of the mind; in Kamakura, Fudo is enshrined at Joju-in and Myoo-in. 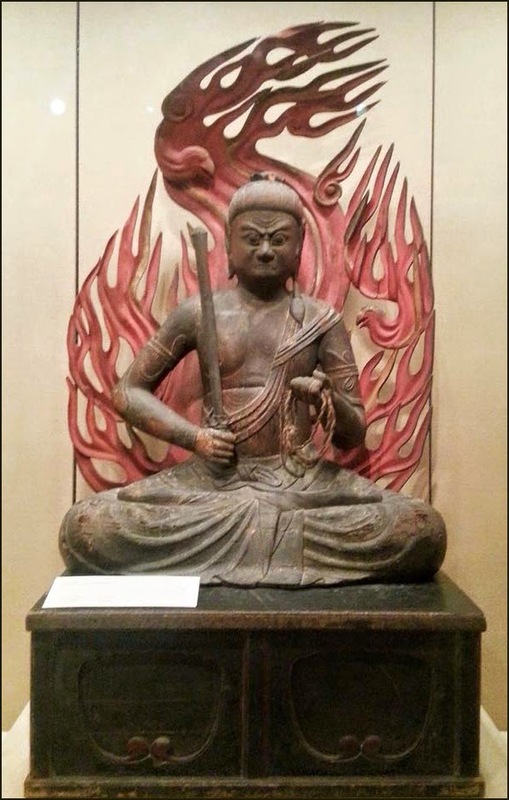 Others say flame behind Fudo originated from the vomit of the mythical Karura." 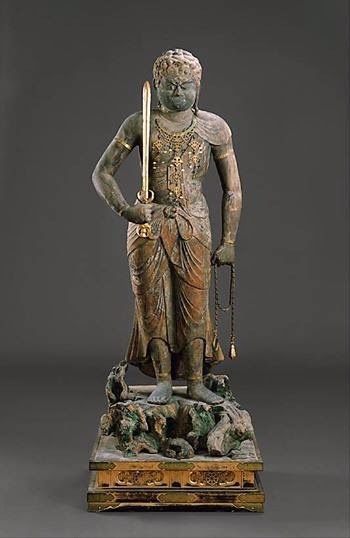 "Personification of Dainichi Nyorai; best known of the five, and one of the main deities of the Shingon sect. 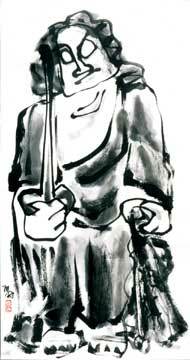 Converts anger into salvation; furious, glaring face, as Fudo seeks to frighten people into accepting the teachings of Dainichi; carries "kurikara" or devil-subduing sword in right hand (also represents wisdom cutting through ignorance); holds rope in left hand (to catch and bind up demons); often has third eye in forehead (all-seeing); often seated or standing on rock (because Fudo is "immovable" in his faith). 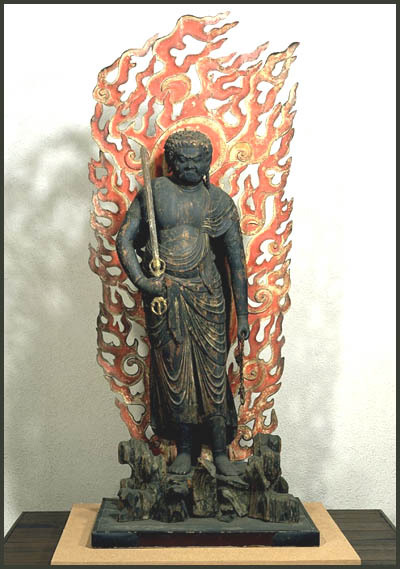 In sculpture, Fudo is often flanked by two attendants, Kongara Douji and Seitaka Douji. " This is quoted from a long illustrated list of Buddhist deities and other information on Buddhism. and a lot more !!!!! The history of the Singing Bowls is quite mysterious. Some say that they were in use during the time of Shakyamuni Buddha, over 2500 years ago, in the indigenous communities of the Himalaya, while others speculate even earlier origins. The theory and practice revolving around the Bowls involves refination, geomantik perception, chakra healing, invocation, prayer, mantra, and astral projection. They speak of the unified field of quantum physics, the tantric doctrine of vibration and the harmony of the spheres. 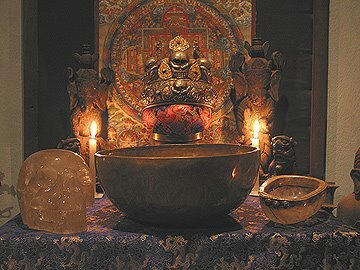 The higher quality Bowls seem to have a particularly healing effect on the chakras, massaging in a sense the subtle energy channels of the light body in a way that relaxes both both body and mind, restoring a peaceful balance to the individual in relation to the environment, and heightening awareness. There is a magik about them that is impossible to describe outside of the singularity of the moment in which they are played. 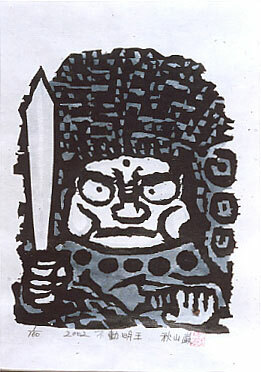 One of the Fudo with five different eye-colors of Edo. For LINKS, see below. 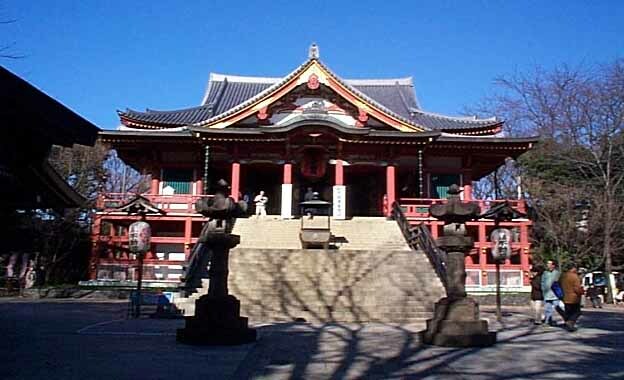 Temples to these five Fudo were constructed by the third Shogun Tokugawa Iemitsu to protect the town of Edo. 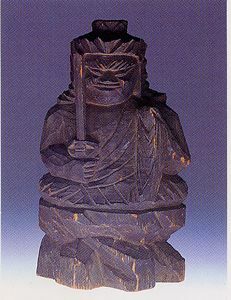 Meaka Fudo was called as Akame Fudo before it was moved to Hon-Komagome 駒込. 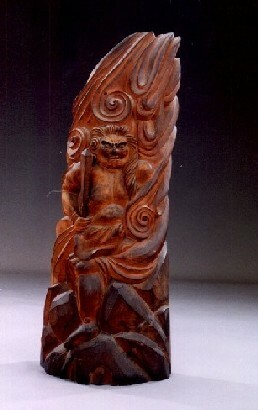 Iemitsu had the Meaka Fudo installed at Do-Zaka 道坂 on the way to his grounds for hawk hunting. The color red was associated with the element fire. Recapitulate the basics of the five colored Fudo. 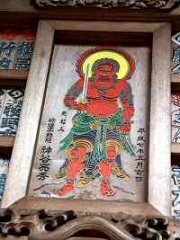 Below is also the Red Fudo, Aka Fudo.
. Mangyoo 満行 / 万行和尚 Priest Mangyo . .
Close to Nankoku-Ji, there is a temple with an Enbiki-Jizoo for drawing your good luck. The chief of the Five Great Myoo and the Eight Great Myoo. He appears in wrath; vanquishes all evil and renders virtue, making trainees decide to attain enlightenment. He has the power to make people attain enlightenment with the wisdom of Buddha. He was called Fudou　(immobile) because he never moves in the perfect spiritual state of concentration in fire, vanquishing all kinds of sins. He appears in a child style; hanging down a pigtail of hair over his left shoulder with his left eye shut thin sitting on the rock. He also holds a sword of wisdom in his right hand, a rope in his left subduing earthly desires of ordinary people. There exists the iconography of Esoteric Buddhism in Giki　(the book of secret ritual practice), however, many of them are created freely. He was attended by Kongara Douji and Seitaka Douji. Gurikara Fudou appears not in Myoo, but a dragon (Gurikara Myoo) coiling itself around the sword of wisdom thrusting on the rock and trying to swallow the sword from its top. 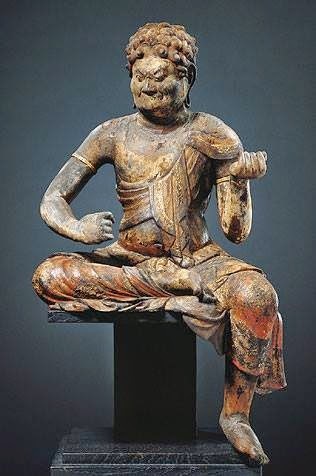 The color of the skin of Fudou Myoo is generally the one of ditch mud's explaining that he saves ordinary people living in the indecency world, however, yellow, red, or blue Fudo Myoo are sometimes worshipped.
. Bokuda Shuu-un 牧田秀雲 Bokuda Shu-Un . It was originally opened at the time Kukai founded Koyasan enshrining as a central deity and image of Godai Myoo. 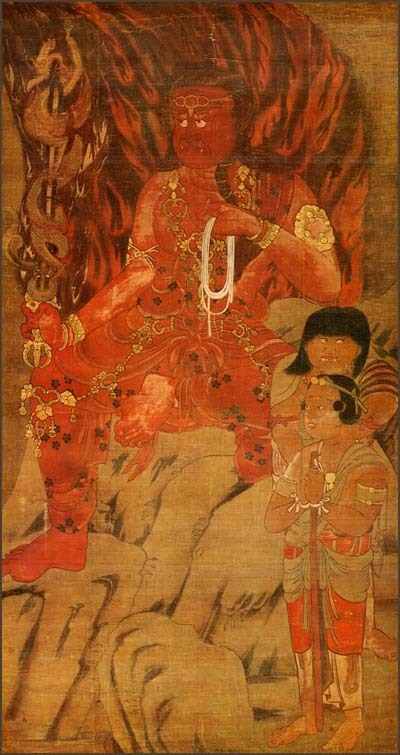 The image was lost to a fire in 1631, however, and presently there is enshrined a painting of a red Fudo Myoo said to have been painted by Chisho Daishi Encho. He used red mineral pigments mixed with his own blood. Literally "Red Youth." Also often called Kasuga Akadouji 春日赤童子. 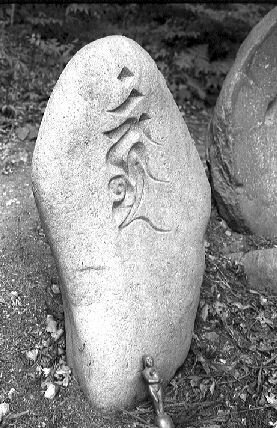 A mysterious human figure said to have appeared on a rock immediately in front of the Kasuga 春日 Shrine gate. He often is shown as a youth, douji, colored red, aka, standing on a rock, and leaning on a staff. In certain poses both in paintings and in prints, Akadouji resembles Kongoudouji 金剛童子, one of the attendants of Fudou Myouou 不動明王. His connection with Kasuga is obscure, but he has been identified with Ame-no-Koyane 天児屋根, the God of the Third Sanctuary there; with Jinushi gami 地主神, the land god; with a healer's helping spirit; and with a thunder god of Mount Mikasa 御蓋, which stands behind the shrine at Kasuga. Extant images date from the Muromachi to Edo periods. 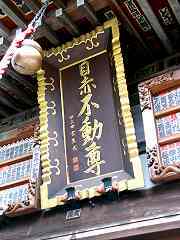 Pilgrimage to 36 Fudo Temples in Kanto (Bando) . 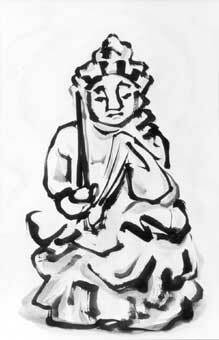 Standing Fudo Myoo (Mokuchô Fudô Myôô Zô). Kyoto National Museum. Kyoto, Japan, 2005. A myoo's job is to remind people to follow the proper Buddhist path in life. You and I tend to be pretty lazy if we are not reminded, don't we? 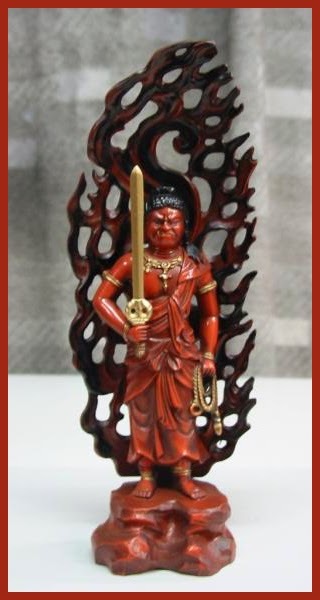 Myoo are purposely given frightening faces in order to warn us to be good. Most of the myoo worshipped in Japan originally came from India, where Buddhism started. Japanese Buddhism has many sects, but the Esoteric sects are especially interested in mystical chants and ceremonies. 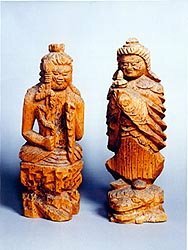 Esoteric Buddhism began in India and was transmitted to China before finally bring brought over across the sea to Japan. The man who is credited for bringing Esoteric Buddhism to Japan was a priest named Kukai. 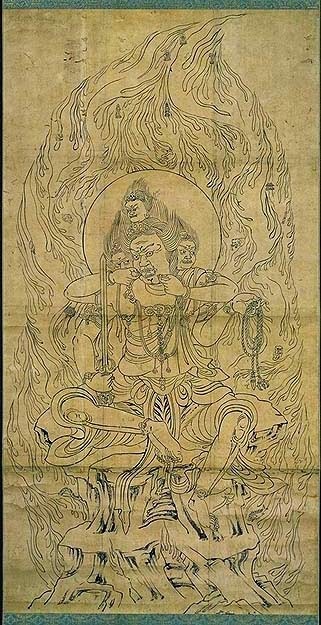 Lets look more closely at a painting used in Esoteric Buddhism. Can you see that the deity is riding on the back of a peacock? 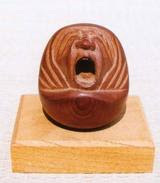 Though it may not look like it, this deity is also a myoo. Though all the other myoo have scary faces, this myoo alone has a kind face. 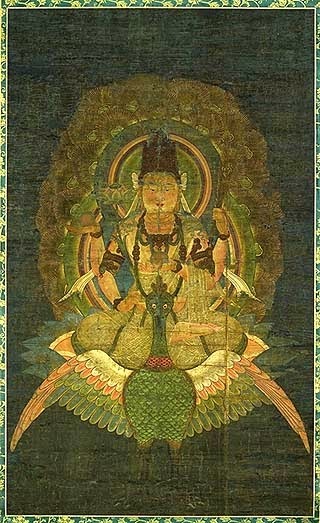 This is actually a female myoo, a Radiant Wisdom Queen, known as the Peacock Myoo. Why do you think she rides on a peacock? For the answer to this question, lets go back to ancient India. You probably know that India has many kinds of poisonous snakes, such as the cobra, who can harm or even kill people if they bite. For this reason, most people are scared of poisonous snakes. This was true in ancient India and is still true today. One way to protect yourself from poisonous snakes is to train them to obey you with a flute, like the snake trainers in India. However, another way to protect yourself is to worship creatures that can get rid of snakes. The peacock is one such bird. According to ancient Indian legend, when a peacock comes face-to-face with a snake, it purposely pretends to be scared and lets the snake wrap itself around its body. Then just as the snake is about to attack, it spreads out its wings and feathers with great force and sends the snake flying! The image of the elegant peacock driving off a poisonous snake, like a beautiful woman driving off an evil beast, made a big impression on people. In time, they began to think that this bird had godlike powers, and the peacock's image crystallized into that of to that of a Buddhist deity. This is the Peacock Myoo. The peacock is facing forward. Its face is a little amusing, don't you think? In the background are golden feathers that look like fish scales. 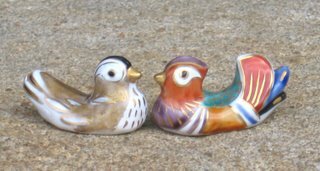 These are meant to represent the peacock's tail feathers spread out behind him. The myoo sitting on the peacock's back has four arms. The reason for this is that deities with more arms were considered to have more mystical powers. In her hands, she holds a lotus flower, a peacock feather, a fruit that looks like a lemon, called a bija-puraka, and a pomegranate-like fruit. Each of these objects has some kind of spiritual significance. The lotus flower in one of the right hands represents the deity's benevolence and kindness. The bija-puraka in the other right hand is a special fruit that cures the sickness of anyone who eats it. One of the left hands holds a pomegranate-like fruit thought to drive off evil spirits. The other left hand holds a peacock feather, with the power to prevent disasters. These objects represent the mystical capabilities of the Peacock Myoo. Esoteric Buddhist paintings are painted in vivid colors. The artists tried to express respect for the Buddhas and their magical powers by carefully painting them with dignified accessories and decorations. The clothing on this Peacock Myoo was painted with luxurious materials. For example, the folds in the cloth are painted in real gold, and the pattern on the cloth is painted in real silver. The silver paint has tarnished to a blackish color over time, but when it was first painted, the whole painting glittered with gold and silver! This painting was made in the 13th century, during Japan's Kamakura period (1185-133). This painting could be used to pray for many things: the prevention of natural disasters or fires, rain, a bountiful rice harvest, the successful delivery of a new baby--for anything, really. These days there are many natural disasters such as volcanoes and earthquakes. In the old days, we probably would have tried to prevent such disasters by worshipping this Peacock Myoo. 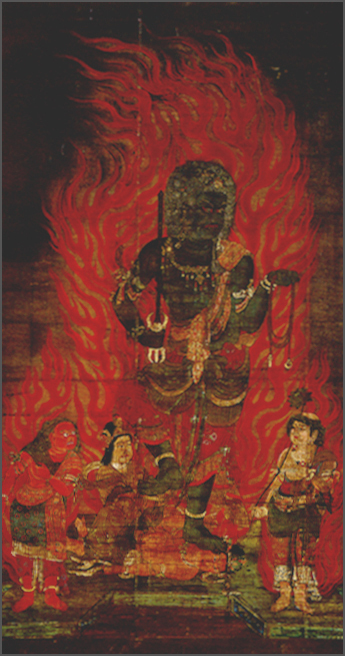 Oyama Fudo, Isehara Town, Kanagawa Pref. Narita Fudo, Narita Town, Chiba Pref. Takayama Fudo, Tanabata Fudo (secret statue) Hanno Town, Saitama Pref. A little Jizoo for Good Bye.